As the fighting in Yemen intensifies, Russia has submitted a draft resolution to the UN Security Council that calls for a humanitarian pause to the Saudi-led coalition airstrikes in an effort to quell the violence that is impacting civilians. 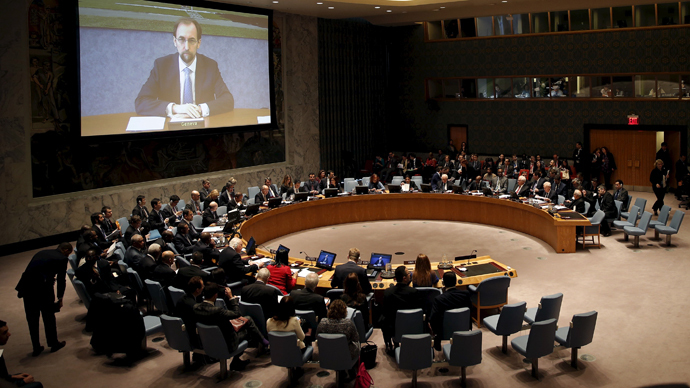 Russia submitted the draft resolution during a closed emergency UNSC meeting that finished late on Saturday. Russia insists it is necessary for the international community to discuss the establishment of regular and mandatory “humanitarian pauses” in the ongoing coalition air strikes on Yemen, Russian UN mission’s spokesman Aleksey Zaytsev told Sputnik. The Security Council’s President for April, Dina Kawar of Jordan, confirmed receiving Russia’s draft, adding that the UN peacekeeping body will consider the proposal. “The Russian delegation circulated a draft resolution to the council members regarding humanitarian pauses in Yemen and expressed concerns over the humanitarian situation in Yemen...council members need time to reflect on the Russian proposal,” Kawar told a press conference. A coalition of Arab states, led by Saudi Arabia, has been engaging Houthi militias from the air for over a week now, after the Yemeni President Abd Rabbuh Mansur Hadi was forced to flee the country and asked for an international intervention to reinstate his rule. Moscow is calling for a diplomatic solution to the conflict emphasizing that foreign military intervention would only lead to more civilian deaths. On Friday, Russia’s Deputy Foreign Minister Mikhail Bogdanov met with the newly appointed Saudi ambassador, conveying the “necessity of a ceasefire” to create favorable conditions for a peaceful national dialogue. On Thursday Russia proposed amendments to a UN Security Council draft resolution on Yemen. The world security body “should speak in a principled manner for ending any violence…in the Yemen crisis,” Russian Foreign Minister Sergey Lavrov said, adding that a draft resolution on the crisis has already been submitted to the UNSC. Meanwhile on the ground on Friday, after coalition bombardment campaign Houthi militias left the presidential palace in Aden, after occupying it a day earlier. “The Houthi militia and their allies withdrew before dawn from the Al-Maashiq palace,” said the official in Aden. The airstrike also reportedly destroyed Houthi “military equipment and missiles” on Myun island on Bab al-Mandab Strait. At the same time Saudi-led coalition airdropped weapons to President Hadi supporters in Aden, coalition spokesman General Ahmed Assiri said. On Thursday, Saudi Arabia claimed that there that there were no “formal” troops on the ground in Yemen. However, the “issue of using ground troops is always something that is on the table,” Saudi Ambassador Adel al-Jubeir said at an event in Washington. The UN estimates that over 500 people, many civilians, have been killed in Yemen over the past two weeks. Though the allied Air Force target mostly military facilities, weapon depots and infrastructure, their strikes still befell on civilians. Tens of thousands have fled the country after the outbreak of violence.